You can find it in Lists and Subscribers -> Subscriber stoplist. Enter the email address in the form. A subscriber will not be included in the list due to a bounce or an unsubscribtion. But once a person is on the Subscriber stoplist, the person cannot make any new subscriptions to your lists. In order to be removed from the stoplist, the subscriber has to accept a new opt-in email in relation to a new sign up. 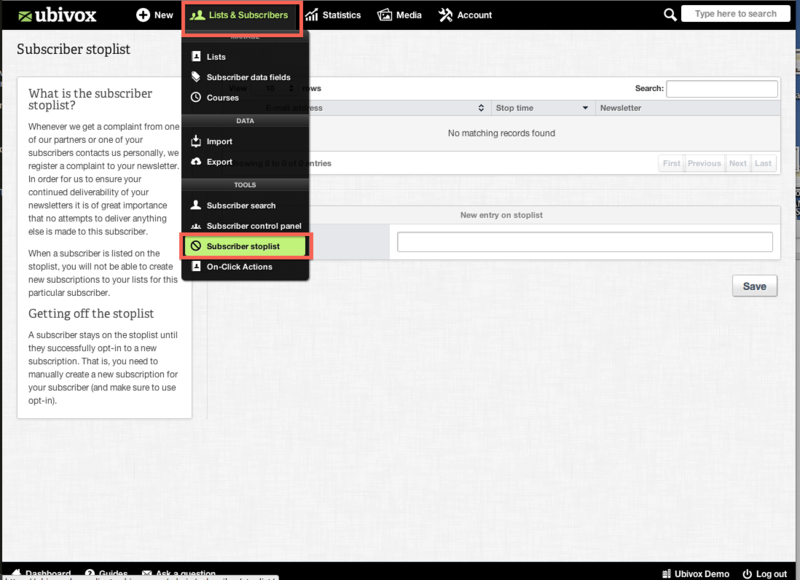 This means that you have to create a new signup for your subscriber and send an opt-in e-mail to the subscriber. Or the subscriber can enroll in one of your forms with double opt-in (Default in Ubivox).